Wincanton Town Council is in the early stages of replacing the existing skate park at the Recreation Ground. To ensure they make the best of it for all users, they invite interested parties to a consultation event in the Town Hall this Wednesday 10th April, 3pm - 7pm. Pop in at your convenience to see the plans for the area, and to discuss ideas and feedback with a representative from Maverick Industries who will be developing the project. Wincanton's skate park was originally built in 2004, and opened on 25th July that year. The project cost a total of £43,600 and was funded mostly by South Somerset District Council and the Foundation for Sport and the Arts. This summer, the facility will turn 15 years old, and is understandably in need of some maintenance. Last year, a group of courageous local youths attended a Town Council meeting to present their case for significant repairs and improvements that should be made to the skate park. They raised awareness of the wear and tear on the tarmac at the foot of some of the ramps that rendered them unfit for some scooters and skateboards with smaller wheels, and suggested the use of new surface materials employed by similar, more modern facilities in other towns. The councillors decided to make immediate, cost-effective reparations to the affected parts of the skating surface so the ramps could once again be used properly, and safely. 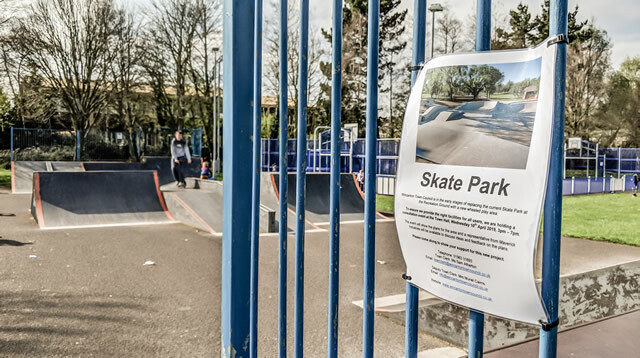 Perhaps more excitingly, they also decided to investigate the possibility of replacing the whole skate park with a brand-new design, and to begin fundraising for such a project. The new facility will make more efficient use of the space allocated near the Multi-Use Games Area, and should represent an improvement in almost every way. It'll cost quite a bit, though, and it's not yet clear how long it'll take to raise the necessary funds, or where they'll be coming from. Wincanton Town Council would like to encourage you to come along to this consultation event and show your support for this new project, which represents a further enhancement to the on-going development of Cale Park. For more information about the skate park project you can contact the Town Council directly by phone on 01963 31693 or email .